THIS ARTICLE FIRST APPEARED ON WELLNESS MAMA. Drinking enough pure clean water is one of the most important things we can do for overall health. In most cases, water alone is wonderful. For times of exercise and exertion where sweat causes mineral loss, a homemade natural electrolyte drink recipe can also be helpful. This post could also be titled “how to avoid a big hospital charge for IV fluids while on vacation.” Hopefully you can learn from my mistake on this one. My husband and I finally got away for a long overdue 10-year anniversary trip (it was a long time after our actual anniversary … because babies). His version of “relaxing” is doing all the activities, so we were snorkeling, sailing, and had plans to scuba dive. Normally, if we’re going to be out in the sun doing strenuous activities, I make this recipe and have it with me. On this trip, since the kids weren’t with us, I’d foolishly forgotten some of the ingredients and figured I’d just make sure to drink enough water. That was working fine until one night (after a long day of snorkeling), I had wine with dinner and probably not enough water. The next morning, we didn’t have any non-tap water in the room so I grabbed a coffee instead and figured I’d get some water when we got to the beach. The beach was busy so it took them a couple of hours to bring out water. At that point, I noticed I was getting a headache. I started drinking water but the headache got worse and I also started having a rapid pulse, dizziness, and nausea. We went back to the room and I cooled off, hydrated, and rested. But the symptoms continued to persist and I felt weaker and more dizzy throughout the day. By that night I’d realized that despite drinking a LOT of water, I still had symptoms of mild dehydration and heat exhaustion. We decided to go in to the hospital so I could get fluids. I probably would have been just fine with rest and rehydration over the next few days, but we were nearing the end of our trip and I didn’t want to be in bed for the rest of our vacation. The doctor decided to insert the IV in my hand, so I expected a normal small butterfly needle often used for this. But he pulled out a 12-gauge needle (like the kind they use when you give blood). After the most painful IV of my life (and I’ve had a lot … because babies), the fluids were in and I immediately started feeling better. So after several hours sitting in an international hospital getting hydrated with IVs, I couldn’t help but think how much easier, cheaper, and less painful things would have been if I’d remembered the ingredients for this electrolyte drink while traveling. Why Not Regular Sports Electrolyte Drinks? So why not just drink one of the many electrolyte drinks available (Gatorade, Powerade, etc.) these days? Not only do they have a lot of questionable ingredients, but making your own is easy, fast, and a LOT healthier. 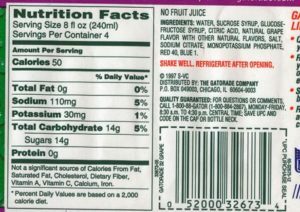 Water, sucrose syrup, glucose-fructose syrup, citric acid, natural grape flavor with other natural flavors, salt, sodium citrate, monopotassium phosphate, red 40, Blue 1. I’m all for re-hydrating, but are the monopotassium phosphate, mystery “natural flavors,” and artificial dyes really necessary? I know from experience that these ingredients typically make me feel terrible and just aren’t worth it. Now, when more than just water is needed for hydration (softball games, triathlons, labor, etc. ), we make our own version. Coconut water is one of the simplest sports drink alternatives and can be used as is. Apparently, coconut water is similar in structure to the fluid used in IV rehydration. For this reason, there are rumors it was used during the Pacific War as an IV electrolyte replacement. It makes a pretty good natural electrolyte drink on its own or with a splash of lime. Coconut water contains more potassium than sports drinks, and more natural sources of sodium. A lot of athletes swear by it these days, and I had it on hand during my last couple of labors. The only downside to coconut water is the price. If you want an inexpensive (yet still healthy and tasty) alternative, this recipe is the next best thing. Salt – A high quality salt adds sodium and other minerals. Juice – Optional but adds sweetness and natural sugars if needed during exercise. Natural Flavors – I’m not talking about the more pleasant sounding name for the not-so-nice additive MSG. Add natural flavors in the form of fresh ginger, fresh herbs, or even natural flavored stevia extracts. Save money and avoid artificial ingredients by making your own homemade natural sports drink recipe with electrolytes. Endless options to make a flavor you love! 1/4 cup or more of juice (optional) – can use grape, apple, lemon, lime, pineapple, etc. 1-2 TBSP sweetener (optional) – can use honey, stevia, etc. I suggest brewing stevia leaf into the base liquid for the most natural option.